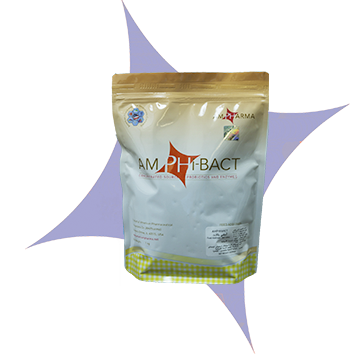 AmPhiBact is a concentrated water-soluble blend of a wide range of probiotic bacterial strains and digestive enzymes for use in poultry feed or water. AmPhiBact contains a unique and balanced mix of Lactobacillus Bifido, Lactobacillus Plantrum, and Bifido bacterium bifidum bacteria in a high concentration that adds to the count and assists in maintaining a healthy intestinal micro flora which helps maximize feed digestion and utilization and prevent digestive upsets. AmPhiBact can be a valuable tool for improving the performance of broiler chickens by aiding in the process of fermentation of silage. AmPhiBact formula also contains a unique balanced combination of the digestive enzymes amylase, cellualse, beta-glucanase, and hemicellulase which help improve the digestive process by working synergistically with the probiotic bacterial strains. The combined bacterial strains and digestive enzymes also help in reducing the PH of the silage, preventing the heating and spoilage of the silage and its loss. The selected bacteria and digestive enzymes help improve the value of the silage feed, giving a better yield and efficiency of the feed and increased average final weight. AmPhiBact is conveniently and easily administered to both feed and drinking water and is easy to use in the dry granulation process of silage. AmPhiBact helps in improving the performance of broilers, increasing the average weight and preventing digestive problems, in addition to reducing the mortality rate. Add 300-350 grams of AmPhiBact for each on ton of feed or 1 gram for each 4 liters of drinking water. Lactic acid bacteria culture, Lactobacillus Acidophilus, Lactobacillus Planterum, Bifidobacterium bifidum, Bacillus subtilus fermentation extract, Aspergillus niger fermentation extract, Cellulase, Beta-glucanase, and Hemicellulase.